At Love Invited we recently had the pleasure of working on an Italian rustic themed wedding invitation for Zach and Gabbie. 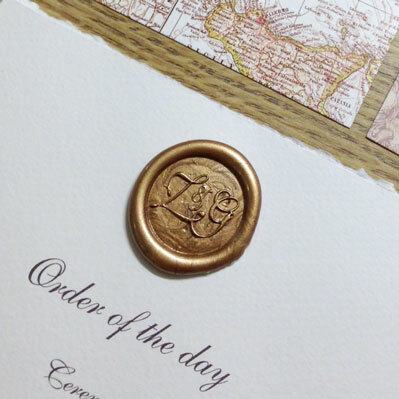 Their brief was to create a rustic but classic wedding invitation which included a bespoke wax seal, made just for them. Their wedding invitation was printed on a luxurious textured card and was wrapped in trace, tied with hemp twine and sealed with their very own bespoke bronze wax seal. We had great fun creating these wedding invitation sets that comprised of the wedding invitation, additional information, menu, map of Italy and complementary ice cream voucher. We wish them all the best for their wedding day and future together.